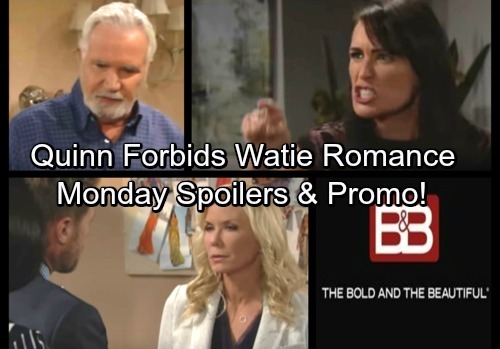 The Bold and the Beautiful (B&B) spoilers for Monday, October 16, tease that Quinn (Rena Sofer) will seethe over her shocking discovery. She’ll yank Katie (Heather Tom) out of bed and rant about her rival’s decision to hook up with Wyatt (Darin Brooks). Quinn will shout that whatever this is, it’s over. She’ll forbid Wyatt from seeing Katie, but he’ll obviously insist that she has no say in this. Wyatt will contend that they’re happy with their new romance, but Quinn will refuse to listen. She’ll mostly blame Katie, but Wyatt’s the one who did the pursuing. Nevertheless, Quinn will yell that Katie needs to stay away from her son. When she’s finished with her tirade, Quinn will head home to gripe to Eric (John McCook). Meanwhile, Eric will feel guilty about hiding the truth. He’ll realize that he should’ve told Quinn sooner, but there’s nothing he can do about that now. Once Quinn brings up Wyatt’s latest love interest, Eric will likely admit that he knew. The Bold and the Beautiful spoilers suggest that another heated confrontation is coming up. Quinn will undoubtedly be hurt that Eric and Wyatt felt the need to keep secrets. Of course, her reaction proves they were right to be worried! Still, Quinn will struggle to cope with all of this. Mateo (Francisco San Martin) will be waiting to comfort her later this week, so more trouble’s brewing. It sounds like Sheila’s (Kimberlin Brown) plan is working out so far. Elsewhere, Brooke (Katherine Kelly Lang) will sit down for a chat with Rick (Jacob Young) and Maya (Karla Mosley). They know that things have been tough since Brooke walked away from Bill (Don Diamont). B&B spoilers say Maya and Rick will just want to check in. They’ll wonder if Brooke has had a change of heart or if she’s sticking to her guns. Brooke will confess that a divorce is in her future. When Rick and Maya seek details, Brooke will come clean about at least part of the story. The Bold and the Beautiful spoilers state that Brooke’s admission will bring outrage. Rick and Maya should agree that Brooke was wise to dump someone she couldn’t trust. It looks like a great episode is on the way. We’ll give you updates as other B&B news comes in. Stay tuned to the CBS soap and don’t forget to check CDL often for the latest Bold and the Beautiful spoilers, updates and news.